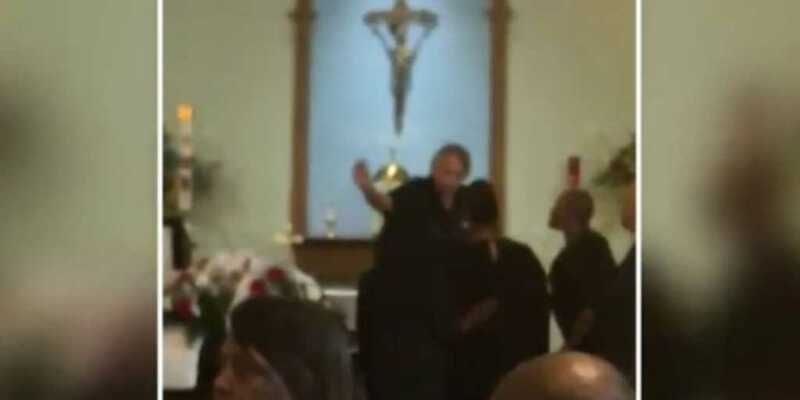 The Archdiocese of Washington has been forced to issue an apology after a video emerged of a priest expelling family members from a funeral service. The confrontation took place at St. Mary’s Catholic Church in Charlotte Hall, Maryland, early last week. According to WTTG-TV, hundreds of people had gathered to pay their respects to Agnes Hicks last Tuesday, but the service ended abruptly when someone knocked over the church’s sacred golden cup or “chalice.” Cell phone footage showed Pastor Michael Briese caught in heated argument with family members as the body laid in an open casket nearby. “This was uncalled for and it really hurt me. It really did. To see your loved one come there to rest and to be shut down like that,” said Larry Hicks, the brother of Agnes Hicks. Her family said the cup was knocked over when two people were hugging and inadvertently knocked the chalice over. Despite it being an unfortunate accident, the priest was not happy at all. Another of Hicks’ children, Renetta Baker, recalled her outrage. “What occurred at St. Mary’s Parish this morning does not reflect the Catholic Church’s fundamental calling to respect and uplift the God-given dignity of every person nor does that incident represent the pastoral approach the priests of the Archdiocese of Washington commit to undertake every day in their ministry,”stated the Church governing authority. But no amount of saying “sorry” will erase the memories of that awful day. “My mom was supposed to have a great funeral and all this came up and I’m so traumatized by it,” Davon Chisley, the son of Agnes Hicks, said.